Lori Whitten is a Staff Writer for NIDA NOTES. When people abuse a drug, they learn to associate its pleasurable effects with the surroundings in which they experience them. This learning plays a major role in addiction. 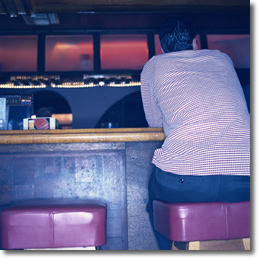 Former drug abusers find that even after years of successful abstinence, they may experience intense cravings upon encountering people, places, and things that were present during their drug-taking. Researchers have been trying to understand how the brain forms such associations and how cues motivate drug-seeking. Until now, scientists have generally assumed that many pairings of drug use and environment are needed to establish drug-cue learning, but Dr. Friedbert Weiss and his colleagues at The Scripps Research Institute in La Jolla, California, recently showed otherwise. 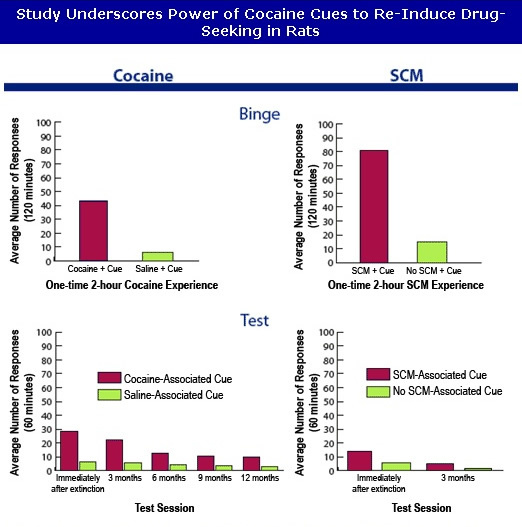 In a NIDA-funded animal study, they demonstrated that rats can acquire such long-term learning in the space of a single 2-hour session of access to cocaine. The rapid formation of drug-cue associations seems exceptional; the investigators also demonstrated that in contrast to cocaine, sweetened condensed milk—a food rats find highly palatable—does not produce persistent effects after a one-time exposure. The investigators chose white noise as the cue they would pair with cocaine and then test. To begin, they placed rats in a special learning chamber where white noise signaled cocaine availability and pressing a lever produced an intravenous infusion of the drug. During a 2-hour session, the rats could press the lever freely; the only restriction on their cocaine intake was a 20-second timeout after each infusion to prevent overdose. On average, each rat pressed the lever 43 times. The researchers hypothesized that during this initial session, the rats learned to seek out the cocaine experience and the rats' brains established a link between white noise and the drug experience similar to the environmental cues learned by people addicted to cocaine. Their next experimental step would put the rats into a state corresponding to abstinence in a former cocaine abuser. To accomplish this, they returned the animals to the test cage, now with the white noise turned off and the lever disconnected from the infusion device. The rats obtained nothing when they pressed the lever that previously had delivered cocaine, and they gradually gave up. When a rat had pressed the lever five or fewer times in three consecutive 1-hour sessions, the researchers concluded that its drug-seeking behavior was "extinguished." The animal's motivation was not strong enough for it to keep pressing a lever that had not delivered an infusion in many tries. In the first two stages of their experiment, Dr. Weiss and colleagues had established white noise as the sole environmental feature in the rats' experience reliably associated with cocaine availability, and the rats had ceased drug-seeking (lever-pressing) behavior. The investigators were now ready to test whether the now "abstinent" rats would respond to white noise by reinstating drug-seeking. Immediately after the rats abandoned lever-pressing, and at 3-month intervals, the researchers returned rats to the test chamber and turned on the white noise. The rats indeed responded by pressing the lever. Moreover, the white noise cue motivated the rats to seek cocaine session after session, even though they never received any, for up to an entire year. In comparison, a different environmental cue associated with saline infusions motivated only a few lever presses throughout the experiment. "Drug-cue learning has a well-known role in craving and relapse in addicted individuals," says Dr. Weiss. "Our observations demonstrate that it takes very little experience with cocaine to establish environmental associations that become powerful cues for cocaine relapse—and contribute to progression from initial sporadic drug use to addiction." In a second experiment that demonstrated the unique reinforcing power of drugs, Dr. Weiss and colleagues showed that a highly palatable food did not produce persistent motivating effects. Following the same procedures they used in the cocaine experiment, the investigators trained a different group of rats to associate white noise with access to sweetened condensed milk (SCM). During access to SCM, rats pressed the lever 80 times on average. Subsequent sessions in the test cage extinguished the rats' SCM-seeking. The investigators then tested white noise's ability to induce the now "abstinent" rats to resume pressing the lever. It did not, either immediately or 3 months after extinction. The results indicate that a "natural" reinforcer does not have cocaine's ability to produce a long-lasting motivational association in a single session of exposure. Up to a year after a 2-hour session of free access to cocaine, rats responded more strongly to a cue paired with cocaine versus the control, a saline-associated cue. In a second experiment, a 2-hour session of free access to a desired food—sweetened condensed milk (SCM)—produced no such long-lasting cue responsiveness. "Clearly, an exceptionally strong association is established when cocaine is paired with a cue," says Dr. Susan Volman of NIDA's Division of Basic Neurosciences and Behavior Research. "This finding is consistent with other evidence that drugs produce especially rapid and long-lasting learning." Scientists don't yet know the exact neurobiological mechanisms that form learned associations from drug experiences. However, researchers have observed that drugs induce changes in brain cells, or neural adaptations, similar to those underlying normal learning. These adaptations result in a modification of the brain's neural circuitry—the interconnected networks of neurons responsible for behavioral, cognitive, and emotional and motivational processes. Dr. Volman explains, "Drugs may produce such rapid and long-lasting learning because they have a double effect: They produce intense pleasure that reinforces behavior and they enhance neural adaptations at the same time. These brain changes might underlie sustained drug-directed behavior and the ability of cues to prompt drug-seeking." In future studies, Dr. Weiss and his colleagues intend to address the physiological mechanisms underlying the different behavioral responses to drugs and to natural reinforcers. Ciccocioppo, R.; Martin-Fardon, R.; and Weiss, F. Stimuli associated with a single cocaine experience elicit long lasting cocaine seeking. Nature Neuroscience 7(5):1-2, 2004.